A view of Almaty, Kazakhstan. Photo by Timur. The Aktau Mountains in the Altyn-Emel National Park that Anne LeBaron and Timur visited. Photo by Sandra Powers. Anne LeBaron (at right) in a yurt. Photo by Sandra Powers. Kazakhstan is the only country in Central Asia that has a classical music station, Radio Classic. 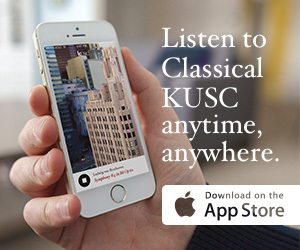 Over the last couple years, KUSC has begun to form a relationship with Radio Classic and learn about their little known, but incredibly vibrant contemporary classical music scene. Nestled up against Russia and China, Kazakh classical music reflects the blend of cultures that make up its people. Russian-style European classical music influences can be heard in some contemporary compositions with Kazakh folk instruments, creating a uniquely Kazakh sound. These instruments, like the dombra and Kyl-kobyz, were created by nomads that roamed the plains of Central Asia for centuries. This special four part series produced by Adriana Cargill for Arts Alive (Saturdays at 8AM, and available as a podcast), will focus on the unique musical styles of Kazakhstan and the country’s connection with our own classical music community right here in L.A.
Anne LeBaron and Timur working on the Silent Steppe Cantata in Almaty, Kazakhstan. Photo by Sandra Powers. The first rehearsal of the Silent Steppe Cantata. Photo by Sandra Powers. Kyl-kobyz players in Almaty, Kazakhstan. Photo by Sandra Powers. Dombra players in Almaty, Kazakhstan. Photo by Sandra Powers. Anne LeBaron and Timur on the road in Kazakhstan doing research for the Silent Steppe Cantata. Photo by Sandra Powers. Image from Timur and the Dime Museum’s performance on America’s Got Talent. Photo by Timur.